This trendy eatery is decked out with smooth minimalistic decor and offers some delicious globe-spanning cuisine. 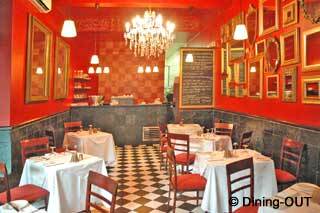 Located on the Main street (a wide avenue) in the sleepy suburb of Greenside the restaurant has a cosy ambience, surrounded on all sides by wonderful art deco homes. The clever gay brigade discovered it first, and the place has since been packed out. The austere interior is black and tan with a bare, polished cement floor and a huge camp chandelier centre stage. A modern eclectic menu offers nice crunchy mushroom soup and Kingfish (rather like a more gamey version of Barracuda) was nicely juxtaposed on a bed of crunchy bitter rocket leaves. Although the menu looks unremarkable, the dishes � especially the specials - are truly worthwhile, in possession of a homey touch not usually found in top restaurants.